If you have images of someone sitting on a crane or steel beam, high above the city, sleeves rolled up, chilling out drinking tea between bouts of vertigo inspiring plumbing feats, sorry! We were that high, it was through the night and the views were magnificent, but it was quite a bit safer and all inside! Aside from the location and the highly unsociable hours, it was an unusual project in other respects, one of them being that we were paid to work and paid not to work! 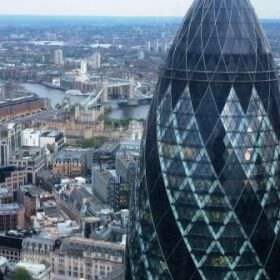 Our client was an independent asset management company responsible for a range of properties and directly involved in Heron Tower in the City of London, in particular two fabulous restaurants, Sushisamba and Duck and Waffle. 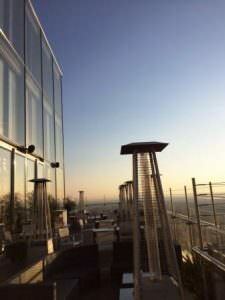 Both restaurants had been fitted out to the highest possible standards and were very much open for business. However, further upgrading of some of the non customer-facing areas was required, work which couldn’t take place during opening hours, hence us burning the midnight oil. The main part of the upgrading work wasn’t plumbing or heating based, but it did require specialist plumbing skills to move, disconnect and re-connect sinks, water heaters, etc. with all the implications for removing and replacing pipework and plumb in both existing and new equipment. The problem was, we didn’t know when we would need to do step in and help, but we had to be ready to do so immediately. Hence the mixture of action and inaction! We worked closely with the other contractors and had two engineers on site full time during the hours when the work was done, which was generally between midnight and 5am. Despite the fact that the majority of the work was done when the restaurants were closed, it was impossible to hide all traces of the work, which meant that time was the essence. We started work in Sushisamba, a superb Japanese fusion restaurant on the 38th floor, before moving up to the 40th floor of the Heron Tower to work on the Duck and Waffle, another great restaurant that serves an all-day British menu. The work was completed in 4 days (nights), 2 for each restaurant and our client, the contracts manager at the asset management company, was very pleased. Ralph and Lewis didn’t get the chance to sample any of the tasty wares on offer, but did enjoy the amazing views over such a lovely city. 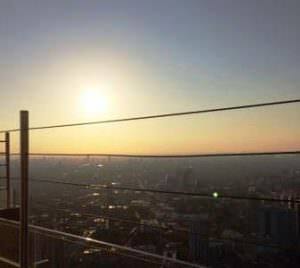 Watching the sun rise over London while on the 40th floor of this stunning building, certainly made the late nights worthwhile.